The Artline 725 Marker is a permanent marker with convenient pocket clip. It comes equipped with a hard wearing and durable superfine plastic nib. 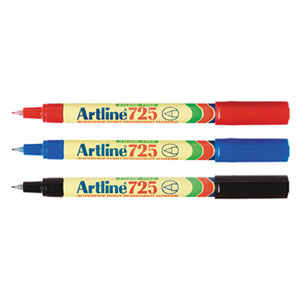 The Artline 725 Marker is ideal for all types of permanent marking, writing or drawing where a fine line is required. Possible uses include shelf labelling, folder or file labelling and marking measurements onto various surfaces.